Can i embed my plugin to ProM public? I'm coding my plugin, but everytime i want test my plugin i must run with Eclipse. So, i want to pack my plugin and run it with ProM (public version from homepage) was installed. Can i do this? Yes, you can. 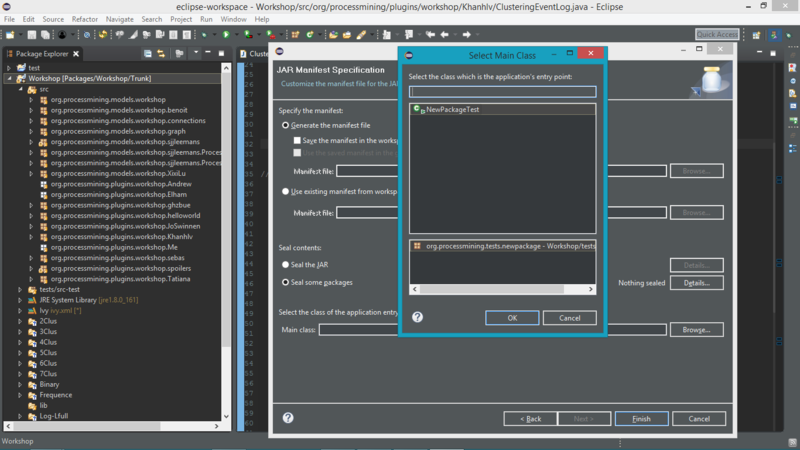 In Eclipse, you can export the project to a jar file. When running ProM, you should make sure that the exported jar file is added to the classpath. I have been tried, but it have a notification: " VM arguments will not be part of the runnable JAR. Arguments can be passed on the command line when launching the JAR". Can you help me? Thank you. It does not have to be a runnable jar. You will not run ProM from your jar file, but form the usual ProM jar file. The scripts that start ProM have the necessary VM arguments, you only need to add the exported jar file to the classpath. Your mean is ProM jar file, which export from source code? 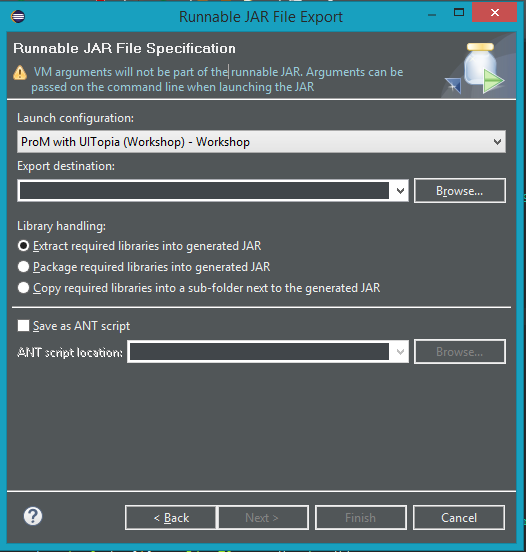 When i try to export usual jar file (Workshop project), it do not have main class UITopica. Not, it is a plain jar file, which also does not contain the main class UITopia. Then start ProM using the changed ProM.bat file. Your plug-ins should available in ProM.